Q. Is it guaranteed that I will see whales and dolphins? A. Bahia Aventuras is located in the south pacific of Costa Rica near the Osa Peninsula. Our tours are focused in and around the Marino Ballena National Park, one of the most cetacean-rich areas in all of Costa Rica. Visitors have the opportunity to see a wide variety of different species from humpback whales to bottlenose dolphins as well as sea turtles, manta rays, sea birds and other marine life. We could never guarantee 100% that visitors will have encounters with whales and dolphins as they are not held in captivity. The beauty of the Marino Ballena National Park is that we do encounter whales and dolphins about 95% of our outings during the whale season which stretches from mid July and October, and again in December through March, as they migrate to and from feeding and mating grounds in the north and south hemisphere. We recommend that you plan two different tours and get your 10% discount with us to see the widest range of behaviors, species and opportunities for close encounters with the amazing marine life the area has to offer. Q. What can I expect to see? Q. Can I swim with whales and dolphins? A. 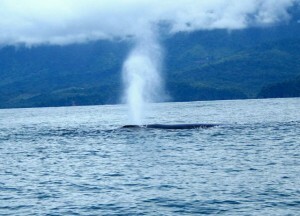 Swimming with whales and dolphins is illegal in Costa Rica. Also illegal is keeping whales and dolphins in captivity, not following legal practices for sightings and encounters and hunting. We encourage other companies to also follow best practices for marine tourism and not put too much stress and disruption on the whales and dolphins natural behaviors. By following best practices for marine tourism we can avoid causing constant disruption to their feeding, resting, nursing and other behaviors that might impact the health and well being of entire populations of whales and dolphins. Whale watching and dolphin encounters from our boats are powerful experiences that ignite a feeling of true awe! By viewing whales and dolphins in their natural habitat from our boat, you can start to explore their world while minimizing the disruption to their natural behaviors. Q. When is the best time to come? A. Anytime is a good time to come to Uvita-Bahia Ballena, Costa Rica and visit the Marino Ballena National Park. The “high tourist season-dry season” in Costa Rica is considered to be mid-November through April due to little or no rain. However, our tours continue year-round! Please remember that the whale season stretches from mid July through October, and again in December through March. As for the dolphins, they are always here! Many visitors enjoy coming during the “low season-rainy season” as there are less people and everything is green and blooming. Q. What is the water and air temperature? A. The water temperature is always between 82-85 degrees (perfect!) and air temperature stays in the low to mid 80’s.